José Huenchunao Mariñán Evaded Police Three And A Half Years. March 21, 2007) José Huenchunao Mariñán, the long-hunted leader of the Arauco-Malleco Association (CAM) Mapuche group, was captured by police in Region VIII early Tuesday morning. The indigenous rights activist, who has been a fugitive from justice since August 2003, faces a ten-year prison sentence for arson against forestry companies. The arrest is the latest development in the struggle for indigenous rights in Chile, a country that has been criticized by several international organizations for its treatment of indigenous groups and for its use of anti-terrorism laws to arrest activists. Huenchunao was apprehended at 7 a.m. Tuesday in the district of Tirúa, after leaving a safe house where he had been hiding out. He was then transported by helicopter to Angol in Region IX, where he awaits internment. The arrest was made through the work of the Public Ministry, Carabineros, and the Investigative Police Force. Police had been concentrated in the region after a number of violent acts took place at the start of this year. Huenchunao was charged with setting fire to the Poluco-Pidenco farm in Ercilla, Region IX, on Dec. 19, 2001. In August 2004, Huenchunao and other members of the CAM group were found guilty of burning 111 acres of pine and eucalyptus trees worth approximately US$800,000 (ST, Aug. 19, 2004). The farm belonged to Forestal Mininco, one of the largest lumber companies in Chile. Huenchunao did not attend the trial and has been sought by the police ever since. The issue of indigenous rights in Chile is one that goes back a long way. The conquest of the Mapuche took more than three centuries – they were the last indigenous people in the Americas to fall to the conquering European (mostly Spanish) invaders. Chile’s handling of its indigenous people during following 120 years followed the same pattern of racist exploitation that characterized governments throughout the Americas. The CAM activist group is one of many Mapuche organizations working in Chile and organizes at a grass-roots level to expel multinational forest companies from the south of the country. The activists claim they have been denied property that was historically given to them by the state of Chile, and that things have not improved since the restoration of democracy in 1990. Notwithstanding an indigenous rights law passed by Congress in the early 1990s, activists claim that property continues to be taken from them by corporations such as Endesa, one of Chile’s largest energy companies. Although former President Patricio Aylwin (1990-1994) promised that the Mapuche would “never lose another square meter,” the government, say the activists, continues to shortchange them. The issue is complicated by the fact that indigenous groups are not constitutionally recognized under Chilean law. In the United States, by contrast, special “reservations” were created for indigenous groups and their rights to self-government have been somewhat protected. 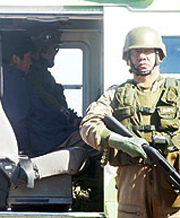 Another complicating factor is the government’s use of Pinochet-era counter-terrorism statutes to prosecute Mapuche organizations that fight for their land and autonomy. The Anti-terrorism Law was passed in 1984, at a time when Pinochet’s rule was facing a growing threat from armed opposition. Under the law, terrorist acts include the burning of fields, woods and buildings with an intent to cause fear. Those convicted of terrorist arson may serve sentences in prison twice as long as those convicted of arson under the normal criminal code provisions. The Chilean Supreme Court has, on appeal, often over-rules lower court decisions which have favored the Mapuche. Human Rights Watch (HRW) and the Chilean organization Indigenous Peoples’ Rights Watch released a report in 2004 entitled “Undue Process: Terrorist trials, military courts and the Mapuche in Southern Chile.” The 60-page report slammed the process by which indigenous groups are convicted of terrorism, arguing that the crimes committed by such groups do not pose a direct threat to life, liberty or physical integrity, and are mostly crimes against property (ST, Oct. 29, 2004). It was largely for this reason that eight members of the CAM group were cleared of terrorism charges, after judges in Temuco, Region IX, ruled that the regional public prosecutor had provided insufficient evidence and used faceless witnesses to convict them (ST, Nov. 5, 2004). The case attracted international attention, as calls were made for Chile to end what is seen as unduly harsh judicial treatment of the Mapuche. Troncoso are also imprisoned in Temuco in connection with the Poluco-Pidenco case. Last year, the prisoners took part in a hunger strike, demanding better jail conditions. Interior Ministry Undersecretary Felipe Harboe said Tuesday that Huenchunao’s arrest is a triumph for Chile’s justice system.